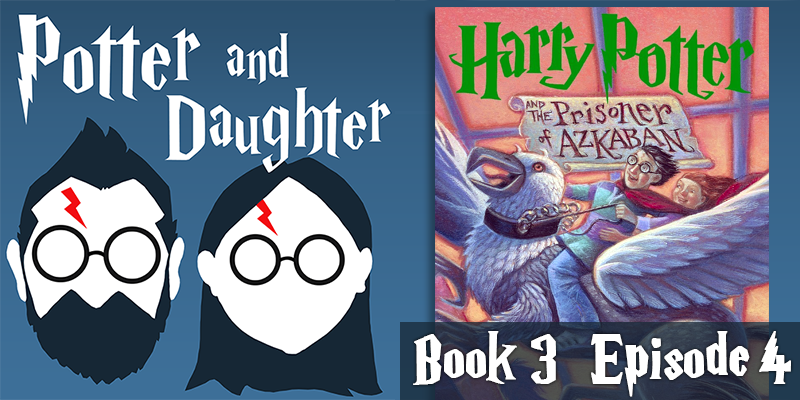 In the eleventh episode of Potter And Daughter, Joel and Lily’s discuss the dramatic conclusion of Harry Potter And The Prisoner of Azkaban, covering chapters 19 through 22. Harry’s world is turned upside down by what he’s learned from Sirius and Lupin, Peter Pettigrew’s true allegiance is revealed, Harry seeks justice for his parents but finds the job of executioner harder than it seems, a full moon derails everyone’s plans, Harry nearly receives the kiss of something-worse-than-death, and the secret Hermione has been keeping all year is finally revealed! Joel also takes Lily down the time travel rabbit hole and explains what a problematic plot device it can be in sci-fi and fantasy and why it must be used sparingly. Harry and Hermione attempt to right the wrongs of the previous day while saving two innocent lives and Harry finds a strength within himself he never knew he possessed.